Product prices and availability are accurate as of 2019-04-17 06:30:03 UTC and are subject to change. Any price and availability information displayed on http://www.amazon.com/ at the time of purchase will apply to the purchase of this product. 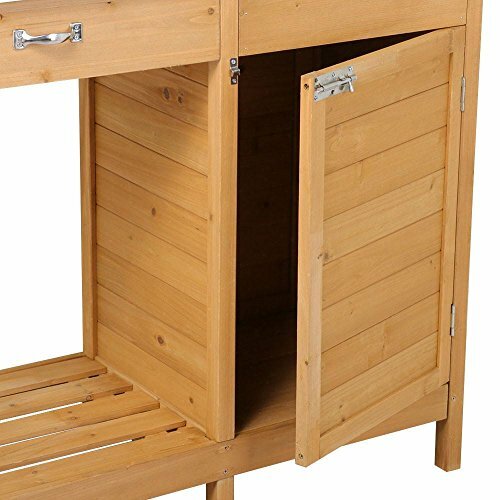 Designed with a cabinet, a drawer and an open shelf, this potting bench can used to hold plants for repotting and adding soil, fertilizer and tools. Wood finish of this garden potting table complements virtually any outdoor decor. 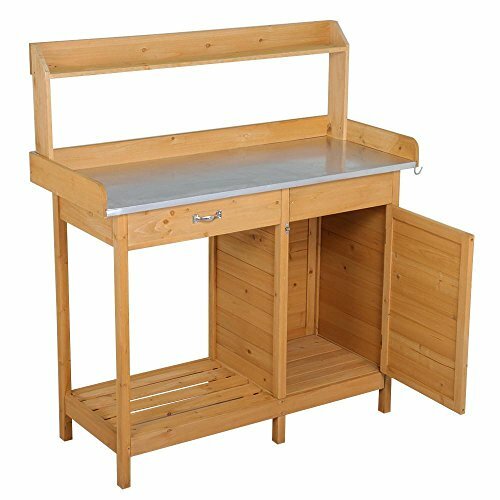 Sturdy structure with selected material: Our potting bench is made of 100% fir wood, which is known for its strength and dimensional stability as well as its natural resistance to rot and pests. Built in a solid structure, the potting tabletop can hold up to 100kg/220lb and 80kg/176lb for the bottom shelf and cabinet. 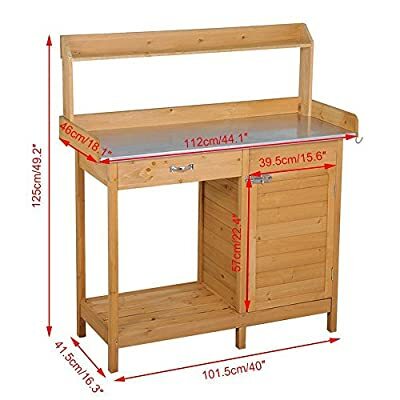 Spacious working/storage space: Measuring 112x46cm/44.1x18.1'', the large tabletop covered with galvanized metal sheet provides you with a corrosion-resistant and ample placing/working/crafting space. 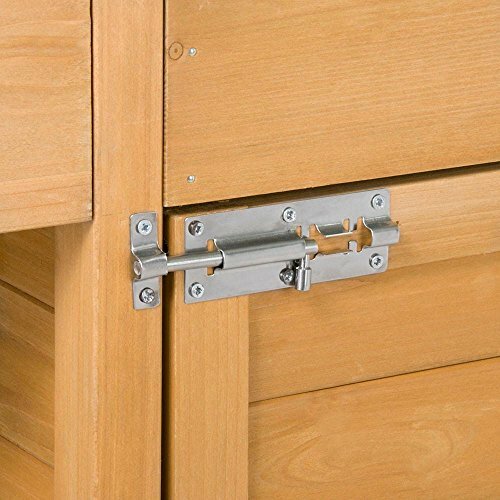 Apart from the drawer under the tabletop, the slatted shelf and the roomy cabinet at the bottom offer open storage and enclosed space to satisfy your various storage needs. 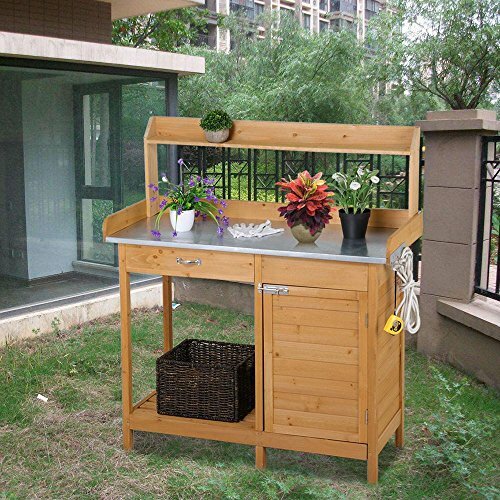 Rich & assorted usage: If you're a big fan of gardening, this potting bench can be a great assistant for you. It also can serve as a display stand for plants, photos and handicraft or storage for grills in the porch, patio and balcony. Handy side hooks: Our outdoor bench comes with three metal hooks on the right side for hanging gardening tools, fire pokes and bags for your convenience. 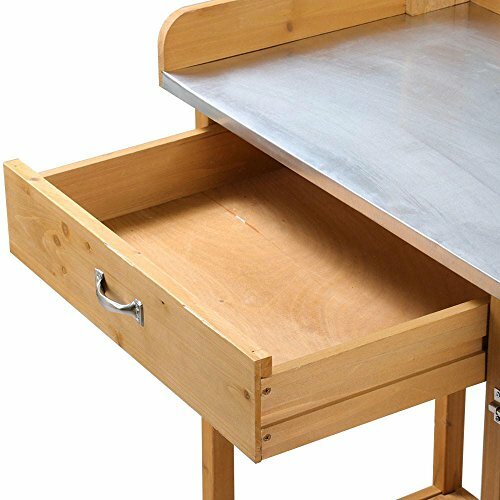 Easy assembly: Simple assembly is required to set up this potting table. We provide an illustrated instruction to help you set up quickly and easily. All parts and hardware are included.